Time for the April Sketch Contest at Ally Scraps!! While I was away on my last scrapbooking trip, I realized I didn't have many sketches for 2 pictures that go in opposite directions. So... since I happen to know an awesome sketch artist personally, I put an e-mail out to Debbie Gaydos and told her just what I wanted. Lucky for me, she got right to work on an awesome one page sketch, with 2 photos. Wow, love it, hope you do too!! Of course, there are a few rules for our sketch contest. 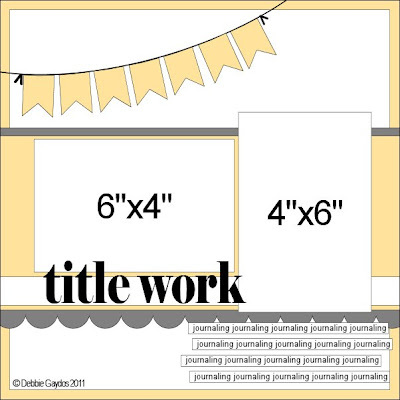 Make a layout using Debbie's awesome sketch as inspiration. You can flip it, turn it, mirror image it... just use the sketch to inspire your layout. Finish your project and e-mail the image (less than 500 kb please)to us by Sunday, April 24th at midnight Eastern time. We will choose a winner soon after. Send your layout to allyscraps@gmail.com. Have fun and good luck! Oh, and the prize you ask?? Well, I'm sure it will be a great one, just haven't figured it out yet. :) Will get back to you soon, with all the sketch prize news. That sketch is amazing! I was so inspired that I've already sent in my layout. Thanks so much for the inspiration Debbie! Glitz tag and card set. A big Ally Scraps welcome to Betsy Veldman! Melissa Phillips is back at Ally Scraps! !